We stayed during the off-season (winter) - rates higher during all other seasons! Like many campgrounds we stay, for us, it's more about location than amenities or being able to plug in. The perfect example of that was our stay at Glacier National Park's Apgar campground. Even though we didn't have water, or electric, sewer (or a dump station), the location was about as good as it could get! Even with the sparse (primitive) accommodations, it was about as perfect a spot as we could hope given the time of year and location. We were close to hiking and biking trails, right off Going to the Sun Road, and knee-deep in wildlife! The downside of Glacier is the 25 miles from Whitefish. Since our only vehicle to travel is our full size truck, our fuel economy (though good for what it is) had us burning through 1/4 tank of fuel a day going back and forth between the park and town - when we first arrived, we were spending a majority of time in and around Whitefish as we were looking for property. But, since the weather was still warm enough to both dry camp and still be able to hike in the late afternoon and evenings (once we complete our work day), we knew that we had to seize the opportunity to stay there while we could. Fast forward to the end of October. The temps were regularly starting to drop into the low 30s with more regularity. Heeding the advice of Gone with the Wynns, we knew that once the temps got below freezing for more than a short time, it wasn't the best of ideas to dry camp. Granted, we have backups and backups for those backups (thanks to my father-in-law!) in terms of heating. If our furnace went out, we had space heaters. If those failed work or the genny failed to operate, we had plenty of propane and a Mr. Heater Big Buddy that produces enough heat to warm up to a 400 sq ft area, just about the exact size of our rig. 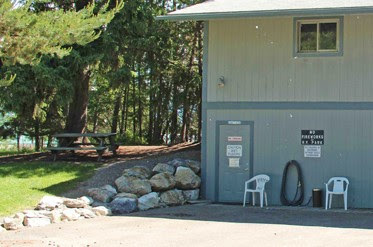 Whitefish RV Park is located about one mile from the center of downtown Whitefish. With a few minutes drive or a 15-20 minute walk, downtown is easily accessible and has plenty to do to keep you occupied! The campground itself only offers a limited number of long-term (monthly) spaces, so make sure that you don't have an issue with that. 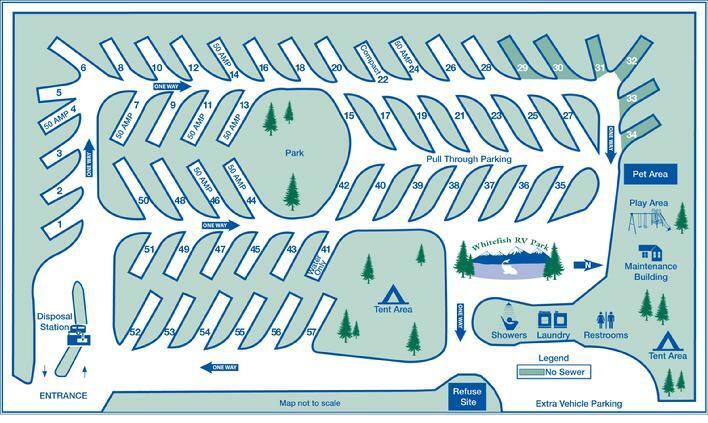 In reference to the above map of the campground, all of the sites from 1-34 (as we understood it) are not plowed during the winter, so these didn't present us with the option. This was a little disappointing because we were hoping for a spot along the treelines. That being said, with over 300+ inches of snow, on average, we decided that a spot that was plowed was probably a good choice! There are showers open year round and offer heated stalls as well as nice hot water! The bathroom itself is also heated to a comfortable level. If you've experienced colder weather camping, you know there is no substitute for a long, hot shower (without sacrificing the 6-10 gallons of hot water capacity that most rigs have)! The laundry facilities are standard with $1-$1.50 per load to wash and about the same to dry. The washers and dryers are a bit dated, but that's not our of the ordinary for most RV parks. We normally find that most RV parks have a very small area for pets to play. Whitefish RV Park is no exception. The pet play area (located on the right side of the map above the maintenance building) is about 10'x20' - not anywhere near large enough for our two miniature horses to run around! That being said, for normal size dogs, this area is more than sufficient (and well-kept) than most that we've seen. Next to the doggie play area is a small playground for kids in the case that you have the two-legged as opposed to our four-legged furry types - it looked like a standard playground to us non-child-having folks!